"There must be something in books, something we can't imagine, to make a woman stay in a burning house; there must be something there. You don't stay for nothing." My first encounter with Ray Bradbury's classic novel Fahrenheit 451 came during my junior year of high school. It was our assigned summer reading and couldn't have been less interested in it. To be clear, I spent my summer devouring tons of other books, but there's something about a "required" read that did little to motivate me. I skimmed through the novel a few days before classes resumed and survived our minimal discussions mostly unscathed. Flash forward to today. I've made it a point to try to consume more classic literature to both appreciate the great works of our culture and to counterbalance my otherwise populist tastes. After finally reading Fahrenheit 451, I realize that this is a novel that speaks directly to me as a life long reader. The future that Bradbury imagined 63 years ago painted a dim future for the written word. 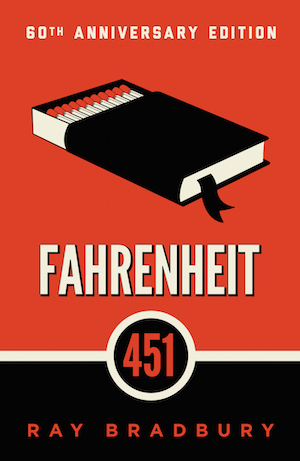 In the book, firemen are tasked with burning books as a way to advance a societal utopia. One fireman, Guy Montag, begins to see through the smoke of this dark undertaking and decides to disobey his orders. I don't think that the 17 year old me was ready to fully appreciate this work. The story takes a bit of time to materialize and I think I lacked both the patience and understanding to see it through. Now I understand that Bradbury is crafting a deliberate vision of the world as he feared it could become. At the same time, he is careful to allow the story and characters to lead the reader to conclusions about the effects of technology on arts and culture without falling into the trap of becoming overtly preachy. It is a tight rope to walk, and Bradbury does it elegantly. Unlike many other dystopian novels in the same vein, Fahrenheit 451 ultimately presents a quietly optimistic picture of the world built by those who still value the power of life. This entry was posted on Tuesday, November 1, 2016 and is filed under Classic,Fahrenheit 451,Fiction,Ray Bradbury. You can follow any responses to this entry through the RSS 2.0. You can leave a response. Sometimes it is best to be able to read a book a bit later on because you become older and therefore more wise. And sensitive to literary devices and also to the true masterpiece a novel really is. I have heard so many brilliant things about this novel which is why it is on my TBR! I agree with everything you said. I think it is also cool to see how our reactions/interpretations of books changes as we grow older.